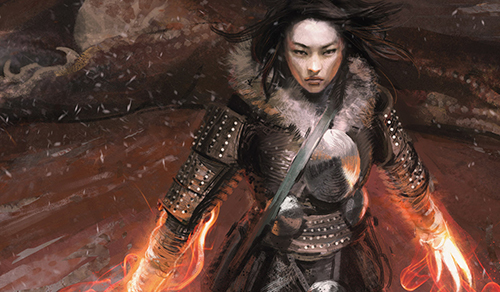 One of the hardest things to do in competitive magic is to brew a new deck from the ground up. Some of the most famous brewers in Magic history; Adrian Sullivan, Conley Woods, Sam Black, Brian Kowal, Patrick Chapin, etc, have all had to go through a lot of trial and error before finding something that sticks. Often, one might be hellbent on getting an idea to work and put a huge amount of time and patience in only to have it turn into a scrap pile. I myself have rarely had a brew that worked in tournament play. Friday Night Magic is one thing, but once you’re playing against Tier 1 decks you need to not only have a deck that can play against the expected metagame, but one that is consistent. Well, as hard as that is, and as often as I have piles upon piles of decklists that never go anywhere, there’s one recently that I really want to give a go at. I’ve heard the chorus uttered time and time again, “This is the age of the internet, whatever you’re trying has not only been tried already, but the pros have already done it better and ruled it out”. That’s a statement I want to take aim at, because while there’s some truth to it, it’s also quite flawed. For starters, not everything has been tried just because of the internet. Sometimes the best ideas only come out because someone actually takes the time to keep drilling and drilling away at a deck until the right piece just clicks, and you won’t get that by pouring over endless decklists or “jamming a few games”. Furthermore, Magic players are lazy these days. The internet provides so much information that it’s easy to copy a successful list, tweak a card or two, and be comfortable with it. If you’re winning, why waste your time with potentially awful brews? Because creativity is not only fun, sometimes it can be the key to breaking a format. 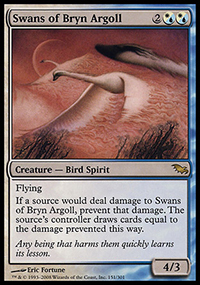 For those not familiar, you could continually pitch lands for damage to your Swans and draw cards. With a high land count, you could pretty much guarantee drawing more lands to continue the chain, while at the same time gaining cards to kill your opponent (either more lands to throw at them or other enablers). The deck was efficient, reliable, and could go off on turn 4 or 5 consistently. That was one example of a successful brew that required finding the right combinations and ideas, but another actually came out of that same tournament by a close childhood friend of mine. My friend, Pat Kenealy, played his home-brewed Elementals list to a 25th place finish. Elementals had been used in Lorwyn to some mild success, but not so far at all in that Standard season. His deck caught the attention of a national writer, and then subsequently caught the attention of a local pro Matt Severa who performed well with it at U.S. Nationals and other high level tournaments. While still an outlier archetype, it became a mainstay of the format and another proving point that brews CAN be figured out and work at the competitive level with enough patience. The deck I’ve been working on for the past few weeks may not obtain any lofty goals. In fact, my only goal with it is to try and make it reasonably competitive on the tournament level, but if it doesn’t win any tournaments that’s fine by me. This is one of those articles I’d love to get feedback on, similar ideas, suggestions on direction, etc. Basically it’s a pile of pet cards on my part, mixtures of ideas I’ve seen, and intuitions from me. I’m going to go over cards that have been in consideration or should be considered, some early lists, and potential new shifts the archetype could take. Note, these three cards aren’t meant to all be played together obviously, they are just the build-around cards. 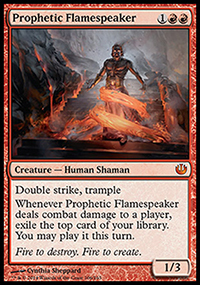 Prophetic Flamespeaker is a sweet Magic card, and one that almost anyone you talk to who likes playing Red really wants to play. Sadly, there’s always just “something” wrong with it that makes it sit on the bench. It shows up here and there, but ultimately the stats, the lack of haste, or something intangible holds it back. I think that still could remain true, but today we’re here to try. 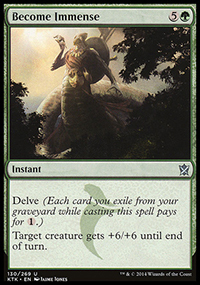 Become Immense caught my eye after seeing it in a few Temur and RG Aggro lists as a one-of, often for huge surprise value and some free win potential. 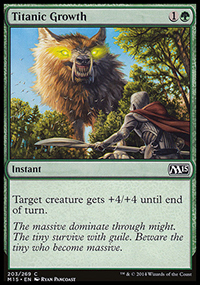 Following that, I started seeing the same from Temur Battle Rage, including getting mauled by it at a PTQ in my hometown from an area pro. We talked briefly after the match, he was running it as a 3-of in his Temur list and it made his Savage Knuckleblade quite silly. Tom Ross and The Pantheon played Become Immense as a staple in their infect deck, and while it was particularly helped out by a faster format with a greater card pool and more specifically Wild Defiance, there’s still potential for crossover in Standard. There are others besides these, but this is a slightly narrowed down list due to their various purposes. Being one mana is important, and those that aren’t are providing a utility or power level that is unparalleled by their counterparts. 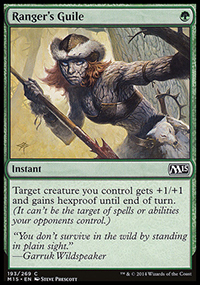 Ranger’s Guile, while relatively weak on paper, could be something to mise or include solely because it helps to prevent the blowouts which are likely to occur when you can’t “play around” what your opponent is doing. People have a lot of removal at their disposal in Standard, and this deck will require more than patience if it is to be successful. It’s going to have some games where you just can’t force things through, wait for opportunities, or play as intended. This is just part of the ball game with a psuedo-combo deck such as this one. 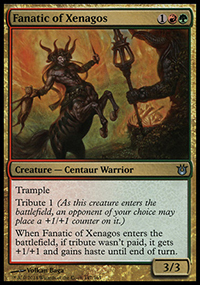 Fanatic of Xenagos is probably the best of these, mostly because it’s a big body for its cost and it has the all important Trample that makes your pump spells go from cute to deadly. It can be haste at times, allowing for the unprepared opponent to just be dead on the spot in game 1. 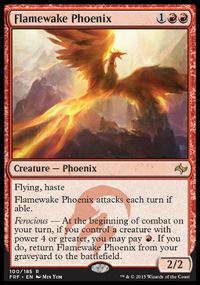 Flamewake Phoenix is much in the same vein, albeit with a smaller body. Sadly, the majority of these creatures cost three mana, clogging up an already occupied spot with Flamespeaker. 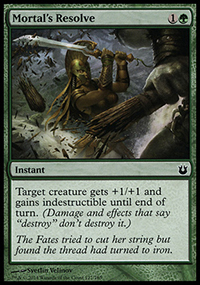 Swiftspear is partially included on the list for this reason, and also due to the fact that she’s just a solid aggro card especially in a deck that can enable prowess often. 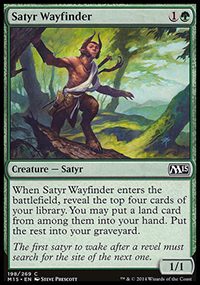 Satyr Wayfinder, while not a particularly aggressive card, is a fantastic delve enabler and a body nonetheless for when you don’t have anything else to do or just need something to make huge. 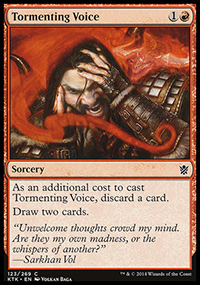 Tormenting Voice helps to keep you on track for combo-ing out, fight through resistance and removal, and fuels delve. I think there’s other cards out there as well that would serve similar purposes, but again this is still a work in progress so I’d love to hear more opinions on it. Cards like Commune with the Gods could take the deck on a more enchantment heavy route, potentially even going so far as to splash a third color like Black for Whip of Erebos and Murderous Cut. But that would require even more work to figure out a decent build, so for right now I’m sticking with straight RG. My first few cracks with this guy were impressive. Getting both him and Become Immense to be 1 to 2 mana cards is not hard at all with this archetype. Sure, like most of the cards here he gets outclassed by Siege Rhino and other big creatures in Standard, but all we need is a turn or two where we can make them pay. His trample and big body go a long way in getting there, and the other spells are what we hope can do the rest. The big key overall though with this deck will be consistency and being able to beat the other known archetypes out there. Let’s look at some of the bigger players and think about how to approach beating them. Definitely one of the most popular archetypes around, and a particularly powerful one. 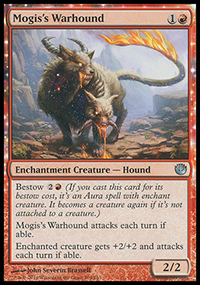 To be successful, we’ll need to be able to have our creatures survive through burn spells, go for broke on the turns when they’re tapped out, and keep a very watchful eye on our life total. Cards like Searing Blood and Wild Slash make sense to me here, as they allow us to keep pace with the tempo and catch up in damage races. They also are cheap enough to help fuel delve, and to keep our curve low. Arc Lightning is another contender out of the sideboard to make sure the tokens don’t overrun us before we overrun them. 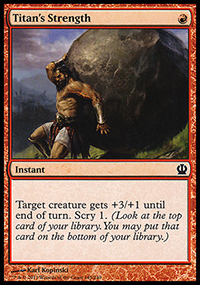 Chandra and Barrage of Boulders could be good to force our Voltron’d guy through while at the same time keeping those tokens down in combination with the previous mentions. While the various flavors require specific addressing, assuming a mostly midrange list our biggest worries are Siege Rhino, Thoughtseize, plentiful removal, and the ability to block. Cards like Hammerhand and Ranger’s Guile increase in value here, with Hunt the Hunter being a potential powerhouse out of the board. We may also need to increase the amount of fliers available, since trampling over might not always be realistic. 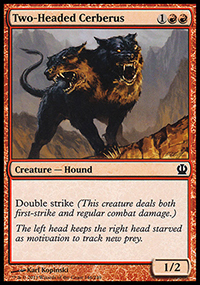 Lightning Strike could be something required for Fleecemane Lion builds, but again we don’t want too many cards that stray from our core strategy. The more reactive we get, the less consistent the deck’s ability becomes. Abzan will likely require a lot of practice and thought to truly iron out, as it’s one of the best decks in the format at breaking apart ideas since it plays the bread and butter of Magic; good creatures and removal. 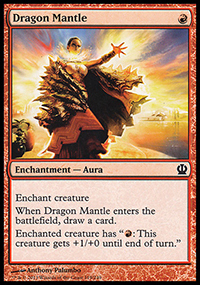 By nature, Control decks have a great ability to stop combo decks since they have mostly counterspells and removal, in addition to these ones having Thoughtseize. 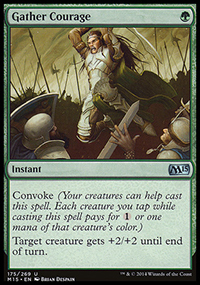 Tormenting Voice and playing aggressive cards help, but we’ll definitely need to get more aggressive post-board regardless of what the maindeck looks like. That could mean removing pump spells and combo pieces while at the same time transitioning into a more straight-forward RG deck which Control decks usually have trouble with. It could just mean lowering our curve; bringing in additional cheap threats like Firedrinker Saytr. Or it could mean to vary our threats by having cards like Ashcloud Phoenix, Shaman of the Great Hunt, and/or Stormbreath Dragon. One of the nice things here at least is that Control decks are often punished when they have to tap out, mostly for wraths or draw spells. So if we can take advantage of that fact and force them into situations where we get a turn to punish them, that will be a key focus. Monsters is likely to be one of the easier matches, because they have very few ways to interact with our combos. Outside of Crater’s Claws and the occasional Strike or Slash, we can basically just assemble voltron and force it through their creatures. Game 1’s will also be easier when they are likely to take an aggressive posture and open themselves for a gigantic counter-attack. Post board they’ll bring in more removal, and the gameplan should be largely similar to what it is against Abzan or RW. These are a few of my very early rough sketches, builds that I’ve been playing with over the last few weeks or just recently developing. They are truly rough, so please don’t just jam these 75s and think they’re ready for showtime. This is again very much a work in progress and a jumping off point for ideas, wherever those may lead. They all have flaws, and hopefully this article and future work by readers and myself can bring polish. This first build is basically ground zero and the one I’ve put the most games in with. It has the synergistic pieces that I’d like to build around, and a reasonable shell to work with. There’s lots of work needed, but it’s a playable start. Hopefully this article doesn’t turn people off, I thought it’d be a nice change of pace from the usual tournament reports and metagame discussion. It’s a rogue idea, but we all love Red cards here and big things, so I’m guessing Immense Rage will be up some of your alleys. These lists are in the super early stages, so they require much of the hard work needed by master magicians, but the idea is the key. Late Edit: As I prepared the finishing touches on this article last night, I found a great companion piece from Pro Tour player Seth Manfield on TCG Player. His list has Flamewake Phoenix and more burn, potentially another great route to investigate further. Definitely worth checking out if you liked the subject here. 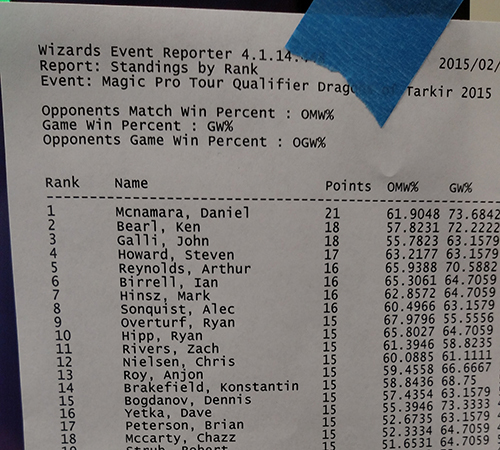 16 years ago (at least according to Wizards), I attended my first Pro Tour Qualifier for Magic the Gathering. This past Saturday, I attended my last. It was a memorable journey, and a lot was on my mind going into the weekend. For starters, this qualifier season was for a trip to Brussels, Belgium. I’m a quarter Belgian and have relatives I’ve never met who live right near there, so it would be unique opportunity to get to see them and also live out a childhood dream. There were two options being considered in the weeks prior, Grand Prix Memphis, and a regular qualifier in Minneapolis. I was originally not planning to do Memphis at all, but had picked up some side jobs for extra cash and knew a number of area pros who were going. There were also others in my playgroup interested in a trip of some kind, so I started scouting out what it would take. I was on the fence, but the costs still looked overwhelming with a minimum of 2 nights in a hotel, twice the entry fee, and twice the food and gas costs. So as it stood, we began planning for Minneapolis. We had 8 interested parties, and potentially 3 vehicles at our disposal. In the end, as usual with everyone’s busy lives these days, those numbers cut down as we hit Friday. While at work, I got a few IMs from folks saying they wanted to do Memphis still and were planning to leave at 3pm. I just couldn’t make it work with my schedule and knew it was going to still be way too much cost-wise. I briefly entertained the idea but decided to stay on course at the end of the day. I used that extra time to playtest a bit after work online, and was going into the tournament with my guns set on playing RW Aggro. It’s now 3AM Saturday morning. My alarm goes off waking up my wife and I, and I figure I’ve probably had about an hour of sleep. There’s no sunlight out, and everything feels lethargic. On top of that, I’m feeling a little flu-ish, and my mind starts racing as to whether or not its worth doing this trip. But as usual, I push the concerns aside, shower, grab my cards, and go to meet my crew. We stumble into our Minivan, bleary-eyed but excited to sling cards one last time at this level. I’m in the far back seat, I can’t hear anything our driver is saying, the heat is blasting so hot I’m stripping down, and classical music is rocking the suburbs. Ultimately things are adjusted and we start talking about all the different decks in Standard, what is to be expected, and what seems like the best trump. The group mostly believes they’ll be seeing a lot of RW Aggro, GR Devotion, RG Aggro, and a splash of everything else. At least that’s what results the prior weekend would indicate, as well as the trending all those archetypes have been seeing in general. I was a little disappointed at the time with RW, not in that I thought it was a bad deck, but that the metagame might be adjusting. It’s one of those level zero decks that is always fairly good, even with a target on its head, but a few games against GR Devotion had unnerved me, as they were either able to ramp into something ridiculous too early in the game or stonewall my early aggressiveness. That, combined with the fact that it was completely left out of the top 8 of Grand Prix Seville was giving me second thoughts. 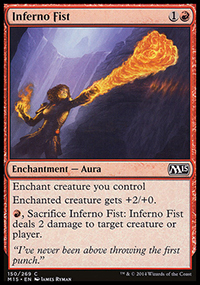 Whisperwood Elemental in particular felt like the best card in Standard. I’d played many games both with it and against it, and the card was just absurd. If he’s not killed on the turn he’s played, most opponents have little chance of a comeback. I quickly talked my carmate playing Abzan Midrange into jamming it into his list, and post-tournament he indicated that he was happy with the choice. Meanwhile on my side of things, I asked if anyone had the cards for GR Devotion, but it sounded like a longshot. On the last leg of the trip, I started reading Martin Juza’s article on his top 8 finish at Grand Prix Seville. 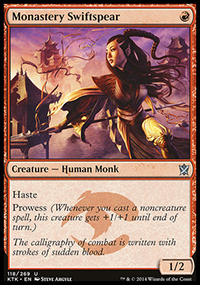 Jeskai, as I had mentioned in previous articles, was always a deck I liked and one that my teammate Brad and I had worked on quite a bit. He’d had some strong finishes with it, and as I’m reading Juza’s article I kept thinking more and more about how good it would be to fly over all these ground stalls and just orient myself with a little more burn. Juza mentions that he beat RW Aggro 4 times at the Grand Prix, and if that was to be the expected field, that seemed like a fantastic position to be in. I wasn’t wild about Treasure Cruise in his list, and he suggested changing it with Outpost Siege (or at least playing more Siege), so I made that change along with running another copy of Dig Through Time. My carmate Kyle who wasn’t settled on a deck decided to hop on board, and we both put together the list at the tournament site when we arrived. Post-tournament I would change a lot from this list, but it sufficed in being reasonable at what it does. Over the course of the day I would play a myriad of archetypes, from RW Aggro, Jeskai Mirror, Sultai Control, Sultai Ramp, Abzan Aggro, etc, with the only blemish being a second round loss to one of the two Sultai Control decks. In that match, he had some fantastic hands to fairly medicore ones of mine, and overall I felt the new build of those decks is much better than it used to be. 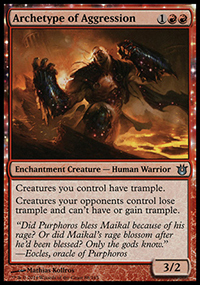 Early Ashioks gave me some trouble along with having all the removal and counters he needed everytime I jammed a threat. Furthermore, he verbally rubbed it in while at the same time taking my Soulfire Grand Master and buying back Hero’s Downfalls with it. Yeaaah. It was pretty ugly. He was from Mankato, Minnesota and had brought a crew, who I ended up running into all day. Fortunately, I got my revenge and dismantled two of his carmates. The third of which would come in round 6 where I had a camera match against RW Aggro. I expected him to be on Sultai Control, only to be staring down Outbursts into Rabblemasters and quickly getting buried in game 1. Games 2 and 3, my Rabble + Mantis prevailed though, along with keeping removal spells up and controlling the tempo. An important note on this match, along with my sideboarding all day, was that I think it’s important not to follow a hard and fast plan. I often, as well as other writers, emphasize this when laying out a guide. I typically tend to board into a more controllish package, and I think against RW you probably even want most of the counters if you expect them to do the same, but many times during the day I just added a smidge of extra sweepers/removal and kept most of my aggro. One of the issues with the mirror or psuedo mirros is that you can fall behind on tempo even if you brought in this great endgame package. Sure, once you hit 5 mana you have plenty of great things to do, but if they’re miles ahead of you on board state you won’t have time to catch up. 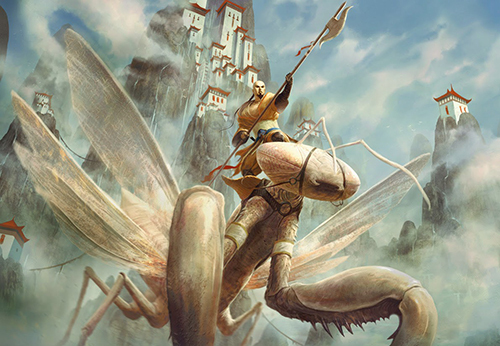 A single unanswered Rabblemaster or Mantis Rider can make all of the difference for either side, and the threshold for getting “burned out” is something that you need to be conscious of on every turn. One of my carmates and I later discussed this when talking about my top 8 match, where I held up burn instead of playing Outpost Siege. It was an extremely debatable line, but the turn I would have played Siege would have let him hit me for 10 with the Rabble and tokens he had out in combination with a presumed Stormbreath in hand. As good as Siege is at card advantage (and it was for sure the difference in that match overall), I would have just been dead far sooner had I played it. I felt the possibility of him bricking on his Siege for a turn was higher than me losing to burn after taking 10 damage. After my camera match, I was 5-1 with one round left. They posted standings and I was at the bottom of the X-1 bracket, in 10th place. There would be no draw into top 8 for me. I was paired against Dave Yetka, a pro player who’s always a fairly congenial guy when I’ve seen him at events or heard stories. He was playing Abzan Aggro and I had just watched him lose to fellow pro Ryan Hipp who was playing Jeskai too. 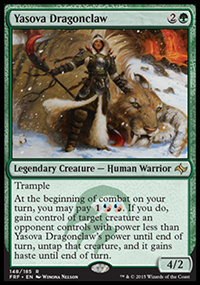 I knew Abzan in general was a dogfight, but the Aggro version felt much better because of the lack of heavy Coursers into Planeswalkers. This turned out to be the case, as game 1 I got about as good a hand as I could ask for and steamrolled him with Seeker into Rabble into Mantis into removal. Game 2 he got stuck on lands and soon enough there was a handshake and a top 8 for me. The top 8 was somewhat unknown, but we knew there was a mix of Jeskai, Abzan, and Devotion. As it ended up, I was paired against Ian Birrell playing RW Aggro. Game 1 was the critical one in my mind, and I wish I could rewind to that moment and play better. I was running on fumes, being powered on by soda and convention food which is never the right place to be with an hour of sleep. I was on the play, and my first few opportunities in hand would be I believe a Rabblemaster, Mantis, and bigger threats later on. I had a Wild Slash, but no followup burn. On his turn 2, he played a Seeker of the Way and passed. This was the first mistake on my part, I declined to Wild Slash it because I was concerned he would play a Rabblemaster on turn 3. Even if he had, I could have fought through that or let myself draw to my outs. Instead, Seeker of the Way started doing his job, and Ian was able to enable prowess on the next 6-7 turns keeping him alive in what was otherwise a battle much in my favor. I was never able to Wild Slash it, and I followed this up by neglecting to play a Stormbreath Dragon when I hit 5 mana. This one was unfortunately NOT on purpose, but simply me being tired and not even realizing it before I passed turn. Had I played that, it would have ate the Stoke in his hand instead of me taking that damage, and I would have had enough to close the deal and be up a game. Instead, at less than 5 life he stabilized and started out card advantaging me, and we were on to game 2. Game 2 I came out blazing, he fought me off for a good while, but I was able to finish him with double dragons. Game 3 I neglected to play a turn 3 Anger of the Gods hoping to soak more value out of it, missed my fourth land drop to play my Outpost Siege, and watched as he played an Outpost Siege and started winning the race. I had a lot of good cards in hand, including a Stoke to control some of his creatures, but he hit solid plays every turn and I never saw that fourth land until it was far too late. In the end, Ken Bearl took down the Qualifier with Jeskai, at least making me feel better about my deck choice. Post-tournament I’m trying out the following Jeskai build. My carmates and I began discussing the blue siege and I’m very curious to see if it’s better or worse than Outpost Siege. The tempo advantage to Jeskai of having it be a three drop as opposed to four is huge, and Merfolk Looter was always an insane card in Sealed so I could see this being good in Standard. Additionally, the “Frost Titan” ability of making them pay more to target your guys could be influential in a match against Abzan or Control where all of a sudden their Hero’s Downfalls essentially cost 5 mana. Lastly, we may still want to add more Dig Through Time as the loot ability is great fuel to allow you to play it quicker. Besides adding more Digs, the Wingmate Rocs are still in testing. Matt Light ran them in his board at Grand Prix Seville and I was discussing the option before Minneapolis. 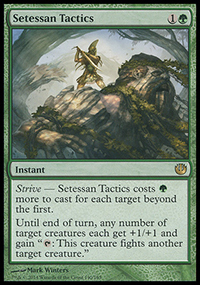 I couldn’t figure out if I liked Elspeth, Sarkhan, or Roc better, but I feel against the Abzan decks I want a value card that is also easier to cast. Elspeth at 6 mana can be really tough to get to, even if it’s probably the best choice otherwise. 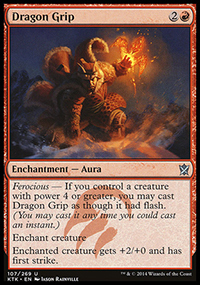 Sarkhan just felt like redundancy, despite his ability to kill Dragons and Rocs. Any of them could be correct, it will probably just depend on the metagame or your personal preference. 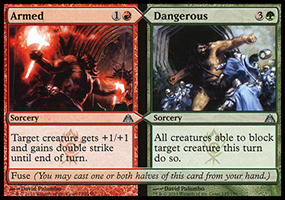 At the PTQ I was sorely missing Abzan Advantage or Erase, so that is coming back. 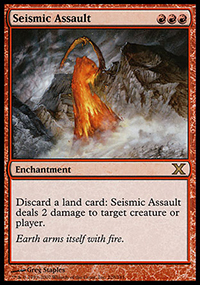 It’s just too important against Outpost Siege + Chained to the Rocks and against Courser of Kruphix + Frontier Siege. While Glare of Heresy is a great card in the Metagame, it’s not solving all the critical problems and thus the numbers have to be spread out a bit. Brimaz overperformed, I wouldn’t mind playing 3 of him in the board. Any time I had a Mantis Rider and a Brimaz on the table I basically felt the game was unloseable. 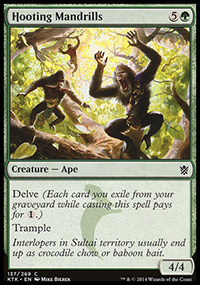 Casting him wasn’t an issue with the manabase most of the time, and he’s still a card many decks have to 2-for-1 themselves in order to deal with. Anger of the Gods was good, but Arc Lightning seems better. Resolved Hornet Queens will always be unfortunate, but killing your own guys or playing around it is also fairly terrible. RW Aggro already plays Arc, and its never been bad for me there, so I think the transition is easy. Ryan Hipp was also playing Arc, and he’s almost always right when it comes to the metagame. The counterspells were straight-business all day, and if anything I’d consider some hard counters. Maybe a Dissolve or a Dissipate, just something to say no to everything. There’s so many games where you get an early board presence backed up by counter-magic and your opponent is just stone dead. This happened in my last Sultai Control match where I landed an early Seeker and Mantis Rider and then sat back with Negate and Disdainful Stroke in hand. 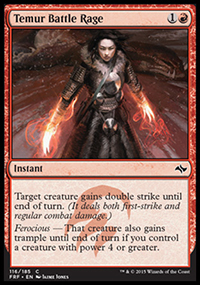 On that same note, I’d keep some number of Valorous Stances in post-board against Control, as it’s a useful in allowing you to not burn through your counters early and instead save them for tough threats like Ugin which can be one of the only breakers to a perfect board state. As for how I sideboarded, I pretty much never cut Seeker of the Way or Mantis Rider, as I always wanted to have the potential for an Aggro start. Rabblemaster usually got cut on the draw, or trimmed, Valorous Stance was mostly cut against Aggro, as was Jeskai Charm, and occasionally I would cut Sieges or Digs when they felt awkward. I’m not wild about losing card advantage, as both cards are usually the difference in a game, but sometimes you just don’t want to be as top heavy or you want to max out on threats. Again, not hard and fast rules here, just ways to throw your opponent off or out-game them. 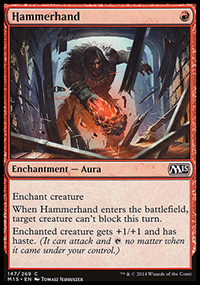 Against Control, I’d cut Wild Slashes and a Strike or Two, with the exception being when you value having something against more rampy/delvy versions (to clear out early blockers). Lastly, I’d almost always go at least a little bigger than game 1, since everyone is planning to Blastoise the hell out of your early game. If Monastery Siege ends up being very poor in testing or not your thing, then more Dig Through Time or Jeskai Charms are probably correct. I like the added burn damage that Charm presents, as well as having more ways to deal with Whisperwood Elemental. That said, it can be the worst card at times, despite its flexibility. The last note of the weekend was watching the closing moments of the SCG LA Open and Grand Prix Memphis. I was sad to see Ben Stark lose in the finals, but his list for RW is what you should be playing hands down. It’s extremely close to Ken Yukuhiro’s list which several in my area have been top 8’ing PTQs with, and one that I always found to be strong. I’m a little remiss at the lack of creature threats, but Ben’s board plan more than makes up for it, and Mastery of the Unseen has potential to be a breakout card if things trend the way they did this weekend. Chad White over on the SCG side stuck to the stock list for the most part, but he displayed why even playing mostly stock can get there. His three copies of Brimaz are one of the things I’d think about moving over to Stark’s list, probably in favor of a singleton Outburst or Removal Spell. The future of Magic for me looks murky at the moment. There are no SCG Opens or Constructed Grand Prixes planned in the area for another 4 months, and the PPTQs just don’t feel the same. I’ve spent a lot of money on the game, and it may be time to start switching gears. I’ll probably try and do a few PPTQs in March, and keep my loyal readers updated, but I was really hoping this weekend would be that final breakthrough I’ve hoped and dreamed for. I’m happy to top 8, and that’s still a huge accomplishment to me, but the thirst for the ultimate goal just gets stronger.